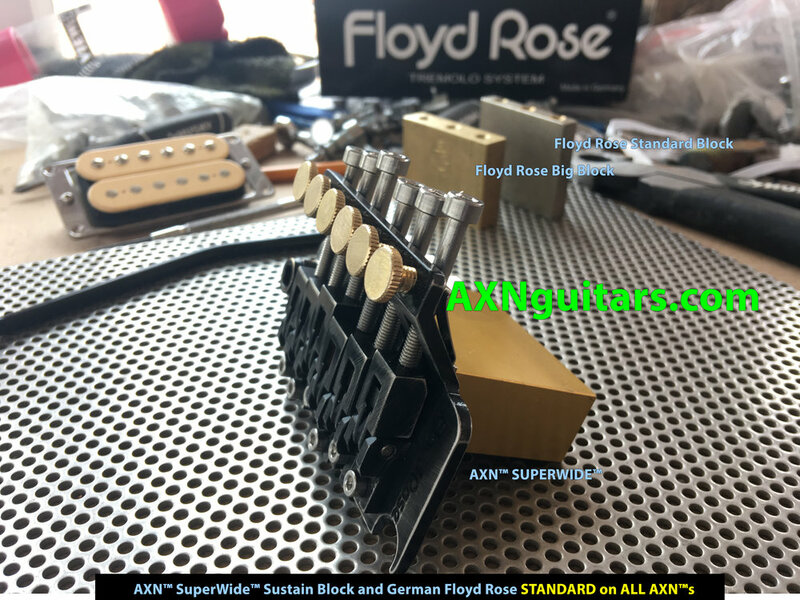 AXN™ SuperWide™ Sustain Block & ONLY made in Germany Floyds! Scottsdale Arizona — AXN™ made in USA Guitars uses an intuitive design approach taking from both modern and vintage ideas. For example the back of our AXN™ Model 2 guitar has a custom size tremolo cavity hole. It is a precise fit for our humongous AXN™ Sustain Block yet does not lose precious guitar tone-wood. We coupled our sustain block with a new German Floyd Rose Tremolo for the Ultimate Floyd Rose Experience. Our specialized AXN™ SuperWide™ Sustain Block is effectively five Times Larger than a standard Floyd Rose sustain block. Every AXN™ Model 2 guitar comes standard with a new Floyd Rose tremolo fitted with our AXN™ SuperWide™ Sustain block. These features add up to a guitar with unmatched resonance, clarity and sustain delivering a Floyd Rose Experience like no other guitar. Our AXN™ Guitars as well as our AXN™ Sustain Blocks are made in the United States of America. In addition every Floyd Rose tremolo we put on our AXN™s are made in Germany Floyds! You can get close or you can get an AXN™.